Ypres (/ˈiːprə/; French pronunciation: ​[ipʁ]; Dutch: Ieper, pronounced [ˈipər]) is a Belgian municipality located in the Flemish province of West Flanders. Though Ieper is the official name, the city's French name, Ypres, is most commonly used in English. 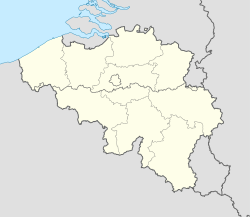 The municipality comprises the city of Ypres and the villages of Boezinge, Brielen, Dikkebus, Elverdinge, Hollebeke, Sint-Jan, Vlamertinge, Voormezele, Zillebeke, and Zuidschote. Together, they are home to about 34,900 inhabitants. During the First World War, Ypres was the centre of Battles of Ypres between German and Allied forces. During the war it was nicknamed "Wipers", as its name was difficult for English-speaking British Imperial forces troops to pronounce.